I took a bit of a hiatus from blogging. One lovely afternoon I was attempting to usher my daughter inside so that I could work on a post. I realized she was chasing a butterfly (for the first time.) I didn't want to squelch that moment. I want to experience all chasing butterfly moments with my daughter. My time is a luxury that I can share with her. I am grateful that my family has made many adjustments to ensure that I can be home for my daughter's early years. So I stopped and focused on enjoying life with her. However, I missed writing and creating. 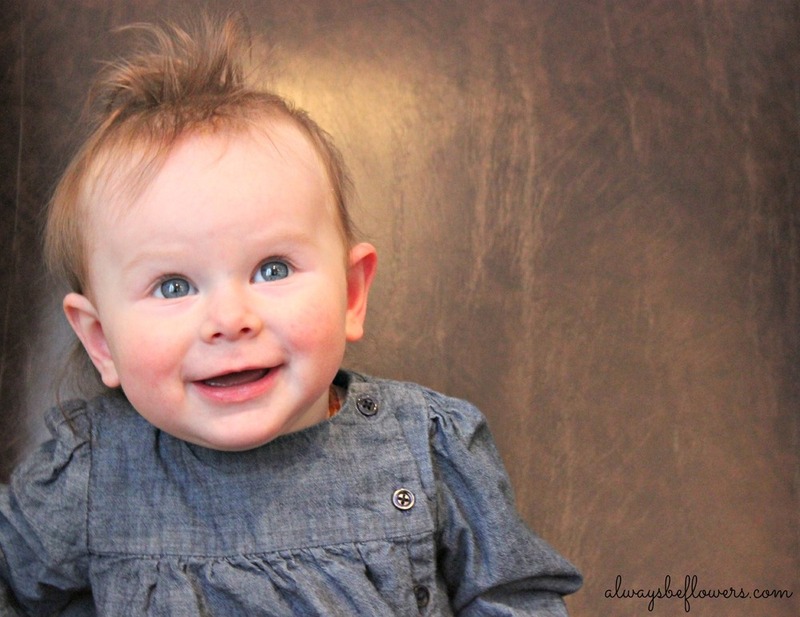 I remembered the inspiration to start this blog was my daughter. I want her to see her mother enjoying a creative career. I have been brainstorming ways to focus my blog better. But I really needed a push to start up again. I came across Kid's Clothes Week, a seasonal challenge to sew clothes for kids one hour per day, for seven days. This challenge seems just my style. I am off to sew for a bit. I will be sharing my "wild thing" creations all week. After the challenge week, I will start my new blog focus. I hope you enjoy my creations! My husband kept commenting that he must have lost his jeans in our move (last year.) It turns out he lost them to my mending and up-cycling piles. He has jeans are (apparently) perfectly broken in and he doesn't care what they look like. But I know that if he keeps wearing them in his usual fashion, the rips will get huge and render the jeans unfit for public display. After 3 pairs with at least 4 tears in each, I perfected the patching of the tattered style jean. The denim patch on these tattered, broken in jeans is barely visible. The inside of a pair of patched jeans. This picture shows the inside of a pair of mended jeans. I cut large pieces of denim (from a beyond repair pair of jeans.) The denim of the patch is soft and worn in. Detail of a denim patch. The key to patching a broken in, tattered style jean is to have thread match the jeans. This photo is the underside, bobbin thread. First pin the cut patch underneath the jeans. Make sure the patch is large enough to fit under all areas that are worn and fraying. This made for quite a large patch on the upper leg (below the interior pocket) of these jeans. Next sew back and forth to secure the worn top piece of denim (the actual jeans) to the bottom. Use the reverse feature on the machine. Also, be certain to use a denim needle. Machine sewing a denim patch to tattered jeans. On left, a small hole. On right, the patched hole. Above you can see the finished repaired jeans. The stitching blends into the denim and reinforced the tattered jeans, which keeps them from over-ripping. I hope this helps you tackle your mending pile! Do you have a specific, frustrating mending project you are not quite sure how to start? Please leave a comment below and I will help you attack your mending pile. Pinterest makes me feel guilty that I have not made a baby book. Pinterest also inspires me to make a baby book. Pretty sure I’m not doing this any time soon. I had every intention of crafting a fabulous record of my child’s babyhood. I was the second child and complained (far too much) about there being no pictures of me as a baby. Inspired by the time-lapse style photos on various blogs, I took weekly photos of my daughter on the same bench when she was very small. 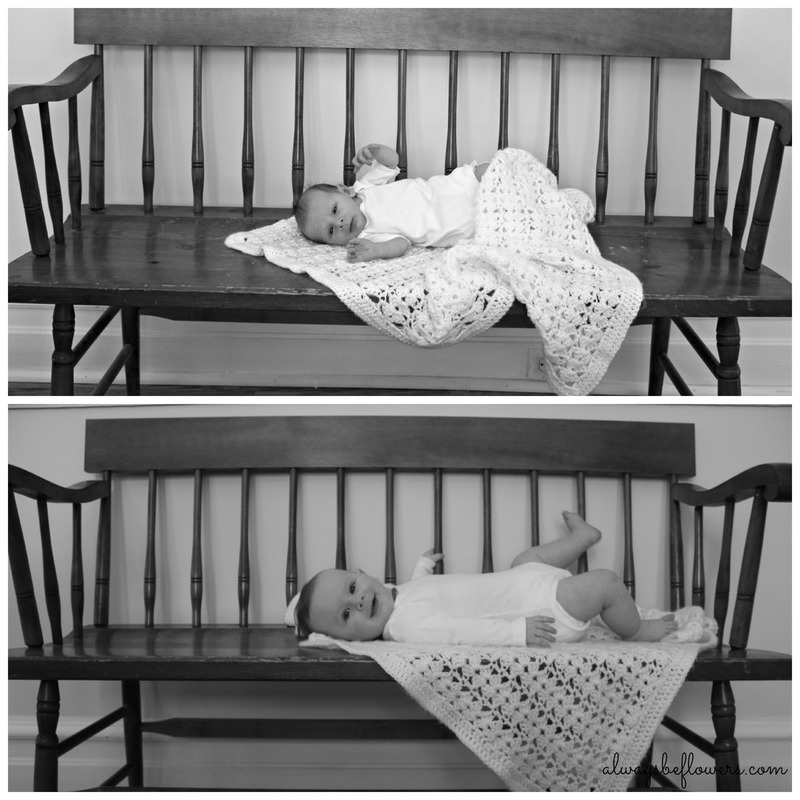 Baby on a bench-Mom photographer fail! The bench part was a big mistake. I read to make sure to use a location they couldn’t roll off, but the idea of her being mobile seemed so far away at the time. I quickly switched to monthly photos on a chair. At month 8, these photos required assistance from my husband. She would try to crawl off the chair or stand up. But with my husband’s assistance, I got great shots of her looking adorably at her Daddy. The best photos were not the ones taken of the specific chair pose. Like so many photos, these memories live in my laptop, and I cannot help but feeling like I have failed somehow. They should be in a book. The big chair pose was fun, but required assistance. I did really get to know my camera in those early months. The best photos are unplanned. My mother recently completed and gave me my baby book. She is retired and now has leisure time. I greatly appreciated this compilation of my childhood and I enjoy that it was completed upon my mother becoming a grandmother. I feel like my daughter will not appreciate such information until she is well into adulthood. Any project completed beforehand would simple be for me. I prefer to not live in the past. I don’t want to be bothering her with what she was like “as a baby” while she is still in the process of growing up. So if I happen to complete this project, I’m not sure I will share it with her until I become a grandmother. My mother claims that she had a fill-in-the-blank type book. She thought all of the questions and topics were stupid. So she pulled out the pages of what she thought was relevant and included them in the scrapbook she recently gave me. This is basically the first page of the book. It also includes school projects and programs that she tossed in a box for the future. Now as a mother myself, I can appreciate that she was simply too busy to wax poetic in a baby book. Sure, she was busy working a super full time job. She was also busy playing with us, building a solid family foundation, cooking daily family dinners, and working to make sure we had every opportunity in life. Making memories takes far more time and effort than recording them. There were no smartphones in my childhood. Treasured moments of childhood would have been nearly impossible to record in photos. But we have dear old family pictures. Since the passing of grandparents, I am now the keeper of many old family photos. I often wonder if my grandchildren will have anything like this. It is hard to fathom passing down my hard drive or an Instagram account. I am prioritizing making the memories. If I come up with time and a way to record or share these memories, it is a great bonus. Kudos to those who have discovered this! However, for all the busy Moms out there, don’t worry about the baby book. Make the memories. How are you preserving family photos for future generations? I love the color of cabbage and use regular cabbage, which is far cheaper than ornamental cabbage. This ledge was once used for standing by a mother picking up from school. I moved this heavy pot to the ledge the next day. Place heavy pots in areas where you don’t want someone to sit or stand. If pots are kept updated with flowers, they are less likely to be used as trashcans. Day lilies are fascinating to a young toddler! I learned giving a toddler dead pieces of day lilies (which I really ought to be pulling out) serves as a good time occupier. Also these act as play swords, but are softer than sticks so I don’t worry about safety. As usual, any toys I brought into the stroller were ignored. Pots and plant markers are a hit. I keep plant markers under a rock on the patio and bust them out when I need to get her attention. I regularly wear my child, but lately she gets uncomfortable when I bend over while she is worn on my back. So our trusty Bumbleride Indie made the afternoon of gardening possible. My gardening is intentional and simply cannot be time consuming. I work quickly. Gardening used to be a more relaxing hobby. Now it is rewarding, but not always relaxing. I love watching things grow, growing our own food, and the decorative aspect. However, with a toddler in tow, I cannot devote time to a perfectly planting and weeded flower bed. I just get it done. This is the bare minimum of my fall planting and decorating. As the seasons change, how do you decorate outside?